The term lexico-semantics refers to the relationship between the lexicon of a language (i.e., its root-words and word-stems) and the various possible semantic categories created by the human mind. Every language (and particularly every language family) divides the world up differently in terms of what sorts of concepts are made into words and how the meanings of those words reflect the reality around us. In other words, the lexico-semantics of a language answers the questions what semantic concepts does this language psycho-linguistically categorize into autonomous words and how are each of these categories internally organized? 1) Ithkuil morpho-phonology only allows for 3600 possible root words, as explained in Chapter 2. This means that the concepts chosen to be conveyed by these roots must be carefully selected to insure the widest range of conceptualization possible within such a limited framework. 2) We have seen throughout this work how Ithkuil’s matrix-like grammatical structure allows for an incredible amount of synergy in terms of morphological word-derivation, generating wholly new, emergent concepts from word-roots, not simply mere conjugations, declensions, and transparent derivations. In order to ensure the maximum amount of dynamism in deriving new concepts morphologically from existing word-roots, it is important that those initial roots be carefully selected in terms of meaning. We will start first with a review of key components in the systemic design of Ithkuil morphology. This will be followed by sections on those areas of Ithkuil lexico-semantics which are most profoundly distinct from Western languages. The last section deals with comparison to Western categorizations, examining how Ithkuil lexico-semantics reinterprets certain concepts considered “fundamental” in English and other Western languages. For those readers who may be trained in linguistics, particulary cognitive linguistics, it should be noted that at this point in the author’s development of the language, a traditional Enlightenment-based theory of meaning, assuming a one-to-one correspondence between a lexeme and its external “in-the-world” referent, has been implicitly assumed for convenience and/or expediency’s sake. A more careful and rigourous construction for Ithkuil’s lexico-semantics, given the author’s stated design goals (as described in the Introduction section), would not assume such a theory of meaning, but would rather incorporate more recent findings of cognitive science and cognitive linguistics to reflect embodied meaning and metaphor-based conceptualization. However, pursuing such a foundation for the lexico-semantics of the language would, in the author’s opinion, be extremely time-consuming (on the order of many additional years, perhaps decades, to construct). Rather than withdraw the language from public availability for such reasons, the author has chosen instead to adopt a traditional/formalist foundation for its lexico-semantics essentially out of convenience, in order to be able to showcase the language's morphology. Ithkuil systematically uses its myriad of morphological categories to derive secondary concepts from more basic concepts, often eliminating the need for separate lexicalization, i.e., eliminating the need to create separate word-roots for new but related concepts as is so often the case in Western languages. We will explore this system of morphological derivation more closely, particularly in regard to its universality across the spectrum of Ithkuil word-roots. We have already seen many applied examples of the above-described concepts, particularly in Section 2.3 et seq. regarding the use of the three different Vr vowel patterns to derive a trinary array of interrelated stems from a root, as well as shifting the Vr vowel of those trinary stems to in turn derive two separate arrays of complementary stems from the initial holistic array of stems. Through this system of vowel shifts, we saw how a single root generates no less than eighteen formative stems, each functioning as a noun or verb. This is illustrated below using the example root -k-‘TRANSLATIVE MOTION’. As described in Chapter 2, this hierarchical pattern of stem derivation and division into complementary stems from a more basic or underlying “holistic” stem allows for significant collapsing in the number of word-roots necessary compared to Western languages, as words that are semantically interrelated in a hierarchical or complementary fashion can be derived morphologically from a basic root, as opposed to being assigned separate word-roots as in other languages. The above root -k- demonstrates how concepts such come versus go are expressed as complementary derivations of a single underlying concept TRANSLATIVE MOTION. All such complementary stems based on participant perspective are similarly patterned, e.g., lead/follow, buy/sell, give/take, etc. Additionally, this hierarchical structure of stem derivation from a single root using vocalic infixes allows for the creation of “built-in” classification schemes and taxonomies for concepts which require them. Biological taxonomies, for example, can be easily accommodated under this scheme, first dividing the two Forms (Designations) of the root into the animal itself versus the animal as a resource, the holistic stems indicating first the generic species then male versus female. The complementary stems then make the further distinction between wild versus domesticated for the informal stem and between food/prey and derived or processed products for the formal stem. Using the nine degrees of the Stem Specific Derivative SSD suffix -k from Section 7.4.13 on such a root, we can extend this scheme to denote specific parts, products or derived resources such as the milk, oil, meat, skin or hide, tail, tusk or horn, hair or fur (e.g., wool), etc. The Degree of Maturity MAT suffix -ph from Section 7.4.10 is also applied to indicate the developmental stage of the animal, providing derived equivalents to words such as foal, fawn, lamb or cub, from horse, deer, goat, or lion. Each of these categories has means to generate amalgamate, holistic, or emergent concepts from a more basic underlying stem. Again we see that application of morphological categories to word-stems serves to generate forms which substitute for lexical distinctions in other languages, thus helping to reduce the size of the Ithkuil lexicon. The same principles applied to other types of stems give rise to a plethora of complex and subtle means for describing motions, paths, trajectories, movement in situ, light emanation, reflection, consistency, texture, variation in shape, visual complexity, etc. It should be noted that in previous versions of the language, formative roots were divided into lexico-semantic “classes” designated by the phonological patterning of the root (there were 17 such classes in the original version of Ithkuil, ten such classes in Ilaksh). In the current version of the language, these lexico-semantic classes have been eliminated, as the author has realized that the establishment of such classes does not serve any real functional purpose in “real-world” spoken/written contexts; the ability to identify the semantic class of a stem does not sufficiently aid in understanding the stem’s specific meaning. Therefore, the assignment of phoneme patterns to roots in Ithkuil is now arbitrary. While the astute reader will note that many roots pertaining to a specific semantic notion (e.g., animals, plant and substance taxonomies, spatial position, etc.) still have similar phonological patterning, such patterning is nevertheless merely incidental and is without formal significance. Another area of the lexicon where Western languages tend to divide up reality into binary oppositions is the realm of spatial dimensions, where pairs such as near/far, small/large, thin/thick, narrow/wide, tall/short, light/heavy, hot/cold, etc. are commonplace. As with the perspective-based oppositions seen in the preceding section, again Ithkuil lexico-semantics treats such concepts in a wholly different way. Rather than lexicalize such concepts as pairs of binary oppositions, Ithkuil delineates these qualities as varying points along a continuous range. In other words, in Ithkuil you do not say X is cold and Y is hot, but rather X has less temperature and Y has greater temperature. Similarly, one does not say A is near to me and B is far from me, but rather the distance from me to A (or proximity of A to me) is less than the distance from me to B (or proximity of B to me). Note that the choice of translation for the latter stem as either ‘distance’ or ‘proximity’ becomes arbitrary, as the real meaning of the Ithkuil formative is ‘amount of linear space separating one party from another.’ Virtually all Western descriptive and dimensional oppositions are similarly handled in Ithkuil as mere variance in the quantity of a single quality, the degree of an attribute, or the extent along a spatio-temporal range or continuum. Concepts of spatial position and orientation are expressed very differently in Ithkuil as compared to Western languages such as English. The three major differences are explained below, each of which will be explored in detail in the sections which follow. 1) Ithkuil does not employ prepositions; all notions of spatial relationships, position, and orientation are designated by nominal/verbal formatives. 2) While Western languages allow spatial/positional reference to function autonomously irrespective of the speaker’s cognitive or semantic intent, Ithkuil subordinates spatial/positional reference at the lexico-semantic level in deference to the cognitive or semantic purpose of an utterance. What this means is that sentences describing spatial relationships or positional reference are only used when the underlying intent of the speaker’s utterance is purely to specify spatial or positional reference information. If, in fact, the underlying intent of the utterance is to show some functional or purposeful relationship (where a spatial relationship is merely coincidental or consequential), the Ithkuil sentence will describe this function or purpose, not the spatial relationship. For example, in answer to the question Where’s Billy? an English speaker might give answers such as (a) He’s standing right next to Sam, or (b) He’s in bed, or (c) He’s in the bathtub. While each of these sentences gives spatial information, only the first is truly intended to convey spatial information as its purpose, while sentences (b) and (c) imply information that is, in fact, more relevant than the spatial information given, e.g., sentence (b) could be restated as ‘He’s sleeping (or sick),’ while sentence (c) could be restated as ‘He’s bathing.’ An Ithkuil speaker would not utter sentences like (b) or (c) in answer to the query about Billy, since he/she would assume the question Where’s Billy? is intended to inquire only about Billy’s physical position in absolute space. If the questioner had, in fact, been seeking non-spatial information, he/she would have asked the Ithkuil equivalent of What’s Billy doing? or What’s happening with Billy? to which a Ithkuil speaker would answer with sentences corresponding to the rephrased versions of (b) or (c), not their original versions. 3) Ithkuil utilizes an absolute coordinate system of comparative spacial reference, not a relative one as found in most languages. Note the positional ambiguity inherent in sentences such as He’s standing to the left of the desk. To be meaningful, the listener must first determine from whose perspective the speaker is referring (i.e., do we mean the speaker’s left, the addressee’s left, the desk’s left relative to the position of the speaker, the desk’s left relative to the position of the addressee, or the desk’s left relative to the direction the desk is oriented/facing?) Such ambiguity occurs because Western languages employ a relative coordinate system which can shift from one participant or referent object to another. Ithkuil spatial reference employs an absolute coordinate system independent of the perspective of a participant (e.g., the speaker or addressee) or referent object (i.e., the thing(s) whose position is being described), as opposed to the relative coordinate system found in Western languages. The Ithkuil system allows listeners to understand exactly the spatial relationship and orientation of any object(s) in absolute space, irrespective of anyone’s (or anything’s) personal perspective. Ithkuil grammar considers the functional relationship between two objects to be primarily relevant, not their spatial orientation or position relative to each other (or between an object and its background). When it comes to describing an object against a background or the relationship between two objects, Ithkuil grammar is more interested in answering the question How do X and Y function relative to each other, rather than How are X and Y positioned in space relative to each other? For example: in uttering the English sentence The vase is on the table, is the intention of the sentence to tell the listener the physical coordinate position of the vase in 3-D space relative to the table, or to tell the listener that the vase is being physically supported (i.e., against gravity) by the table? If the intention is the former, the corresponding Ithkuil sentence would indeed utilize a spatial formative translatable as ‘manifest self on the top side of a surface that is horizontal relative to the direction of gravity.’ However, if the intention is to actually indicate support against gravity, the Ithkuil sentence would not utilize a spatial reference at all, but rather translate the sentence more or less as The table is supporting the vase. As a result, spatial, locative, or orientational formatives in Ithkuil are used far less often than corresponding prepositions and spatial constructions in English or other Western languages. Note the following examples illustrating how various English sentences utilizing the concept ‘in’ (meaning ‘inside’ or ‘into’) are translated into Ithkuil using various non-spatial roots based on reason or purpose. The man works in(side) that building. general locational reference where idea of interiority or containment is incidental The man works at that building. The book is in that box. physical containment only with no specific purpose That box contains the book. You’ll find pencils in(side) the small blue can. incidental, temporary, or circumstantial constraint/holder to prevent spillage from gravity The small blue can holds the pencils you’re seeking. We stayed in(side) due to the rain. shelter, containment for purpose of protection We shelter ourselves from the rain. He placed the sword in(side or into) its sheath. containment in fitted covering for purposes of protection He sheathed the sword. He stayed in(side) his room. containment for purpose of privacy He shuttered himself. The tiger was kept in(side) a cage. containment to prevent escape The tiger remained captured. There are high concentrations of lead in(side) that pottery. ingredient, composite substance That pottery contains much lead. Microchips can be found in(side) any machine these days. inherent or integral component These days, any machine incorporates microchips. I put fuel in the gas tank. integral component having function to hold or contain other component I (re-)fueled the gas tank. We’ll never know what’s in(side) her head. intangible containment We’ll never know her thoughts. He has a tumor in(side) his pancreas. enveloped to inaccessible depth by surrounding medium His pancreas “harbors” a tumor. He hammered a nail in(to) the wall. fastening/connecting He fastened the nail to the wall with a hammer. The child tried putting the square block in(side or into) the round hole. fitting together one object to another The child tried to fit the round hole and the square block together. This functional prioritization notwithstanding, Ithkuil is nevertheless able, if necessary, to describe true spatial relationships and orientations quite specifically. However, it does so in ways that are very unfamiliar in terms of Western grammar. These are described in the following section. While Western languages are capable of describing the physical position and orientation of object in absolute terms (e.g., My hometown is located at 93°41'36"W by 43°12'55"N), it is not normal to do so in general parlance. Rather, Western spatial position and orientation is normally relative, i.e., described from the dynamic perspective of the two objects themselves or from the perspective of a third party observer (usually, but not exclusively, the speaker). Therefore, if I describe the position of objects in my backyard to you on the telephone, and you have never seen my backyard, phrases such as ‘the swingset is against the wall,’ ‘the barbecue is sitting to my right,’ ‘the elm tree is behind the shed’ and ‘the rose bush is beyond the bird fountain’ convey little information without first having to establish a common frame of reference based on where the speaker is positioned relative to the edges of the yard (in order to interpret what he means by ‘beyond the fountain’), which way he is facing relative to the yard (in order to interpret what he means by ‘to my right’), perhaps even the orientation of the shape of the yard relative to some external absolute system of orientation (e.g., the four cardinal directions N, S, E, W). In such a relative scheme concepts such as ‘to my right’ change completely if I turn my body 180 degrees. Confusion also occurs when I say ‘to the left of the chair.’ Do I mean to the left side of the chair from my (the speaker’s) perspective? Or do I mean to the left side of the chair from the perspective of someone sitting in the chair? 1) Solar-based system. This is the standard Ithkuil system of reckoning. The line of the Y-axis runs parallel to the rising and setting points of the sun in mid-summer, with the vector oriented in the direction of the setting sun. Note that the alignment of this Y-axis relative to the X-axis is variable; i.e., the line connecting the rising and setting points of the sun merely designate the direction of the Y-axis, not it actual position. This is necessary so that descriptions of spatial relationships can be made using a “octant locator” system based on this grid, where any two objects can be made to lie within different octants relative to each other (this will be illustrated below). Use of this solar-based reckoning system continues at nighttime and on overcast or rainy days, based on society’s collective knowledge and/or recollection of landmarks indicating the rising and setting points of the sun. Use of this system even continues indoors if there exists a collective understanding of the orientation of the building/structure/room relative to the solar-based Y-axis (i.e., everyone in the room can still tell the orientation of the outdoor Y-axis, whether by sight through windows, or by noticing that the length-width ratios of the room are aligned with the outdoor Y-axis). 2) Length vs. width of enclosed space or room. In indoor situations where the orientation of the outdoor solar-based Y-axis is unknown (or cannot be readily determined on a continuous basis as new speakers enter the room), an arbitrary Y-axis is connoted by the length of the room in a direction away from whichever end of the room displays a visibly unique feature (e.g., the doorway, a window, an alcove, an imposing piece of furniture, a stage or dais, etc. ), this symbolically substituting for the position of the rising sun. This is the coordinate system which would be employed in theaters, enclosed banquet halls without windows, and cellars without windows or ready access to outside orientation. 3) Arbitrarily delineated axis based on local landmarks, objects, or persons. This is similar to a Western relative system in which the speaker announces the orientation perspective being utilized. An Ithkuil speaker would consider this a highly unusual and “affected” method of reckoning. Nevertheless, it is possible to designate a personally defined reckoning system using words to designate the origin point and direction of the Y-axis vector, examples translatable by such phrases as ‘based on a vector from me to that large window’ or ‘based on a vector between the shed and the big oak tree.’ In fact, this is the purpose of the NAVIGATIVE case (see Sec. 4.7.6). The primary use for this system of reckoning is literary or narrative, such as when a speaker tells a story of another time and place, in which he/she wishes to describe spatial relationships solely within the context of the story in order to convey a mental map or image of the goings-on to his/her audience. 10.3.3.1 Describing Spatial Relationships between Two or More Objects. Using such a triaxial three-dimensional grid, Ithkuil then lexically divides up space into “octants”, four quadrants to each given “hemisphere” of absolute space delineated by the three axes, for a total of eight octants. There are eighteen additional roots corresponding to the above where either one or two of the X/Y/Z values are zero, indicating concepts equivalent English phrases such as ‘neither above nor below,’ ‘straight down,’ ‘straight ahead,’ ‘directly behind,’ ‘straight up,’ ‘on the same plane as,’ etc. Additionally, the LCT suffix is used with these roots to identify the location of objects within a specific octant. The above octants are indicated in the illustrations below. Because the lateral alignment (but not direction) of the solar-based X and Y-axes are variable (i.e., each can be slid laterally relative to the other axis), any two objects whose relative positions are to be described can be made to fall within two different octants, as illustrated in figures A, B, C and D below (Figure A represents the background context for which Figures B, C and D present varying positional frames of reference). Additionally, such a positional reference system allows a speaker to describe exactly the spatial relationships between two objects in motion relative to each other. This is done in Ithkuil by stating that two object are moving from positional frame A toward positional frame B. If one remembers that, by “positional frame” we mean a spatial relationship between two objects, not a specific location in space, it can be seen how such a simple formula easily describes the relative trajectories of two objects. An Ithkuil speaker is describing exactly how two objects are moving through space by stating in one short sentence the octant-to-octant relationship the two objects have to start with, and the octant-to-octant relationship they will have when the motion is ended. The root used to describe the motion indicates the nature of the motion in terms of its smoothness, speed, etc. To insert a third party into a positional frame (such as describing where the speaker or addressee or third party is situated relative to the two objects described in the positional frame) a case-frame clause is added to the sentence in the concursive case (“while/during/at the time of”) which states the positional frame between that third party and the FIRST party (unless the 2nd party is overtly specified). Example: “The dog and the ball M’d while the cat N’d,” where M is the positional frame of the dog and ball and N is the positional frame between the cat and dog. Based on the above, we can see just how exact Ithkuil can be in describing relative position between objects in an absolute manner. This is best illustrated by narrowly translating into English an Ithkuil sentence which describes a three-party positional situation. Qi’êlafs âmmul âhiogwokstatükai íxi’asa açthu pštâ’at. As the woman held still, the boy ran from a position above, ahead of, and to the right of her relative to the direction of the sunrise-to-sunset vector, a plane perpendicular to it, and the axis of gravity, toward a position still above, but behind and to the left of her relative to the same directional vector, perpendicular plane and gravitational axis, as I was watching them from below, behind, and to the right of her relative to the same vector, plane, and axis. In a word-for-word comparison to a Eurocentric vocabulary, especially one as large as that of English, the Ithkuil lexicon appears very overgeneralized in many respects. At first impression, it appears that shades of meaning expressed by multiple words in English are expressed by only one root in Ithkuil. As we have seen repeatedly throughout this work, this is primarily due to the fact that shades of meaning for a single underlying cognitive concept are normally differentiated at the morphological level in Ithkuil, as opposed to the lexical. Nevertheless, there are several lexico-semantic areas where Ithkuil truly does generalize in comparison to Western languages. This occurs primarily where (1) Western vocabulary distinguishes separate lexemes for a redundant concept based on different participants to, practitioners of, or manifestations of that concept, and (2) where lexification is at an arbitrarily detailed or particularized level. These topics are discussed in detail in the following sections. As an example of lexical generalization in Ithkuil (or over-lexicalization in English! ), compare the following words for animal vocal sounds: meow, bark, whinny, chirp, moo, bray, etc. Each of these words mean merely to make one’s species-specific inherent vocal sound. Ithkuil utilizes only a single stem for this concept (essentially meaning vocal sound/vocalize – from the same root which gives the stem for (human) voice), based on the logical assumption that, since cats can’t bark, whinny or moo, and dogs can’t meow, whinny or moo, there is no need to differentiate lexically the innate vocal sound being made by an animal if the animal making the sound is identified in the sentence. Of course, one might argue that English allows for metaphorical or similative application of such words, as in The sergeant barked out orders to the platoon, or The baby squealed in delight. Such constructions are perfectly captured in Ithkuil via the ESSIVE and ASSIMILATIVE cases, as in He ‘vocalized’ the orders like a dog, or The baby ‘vocalized’ like a baby piglet from feeling delight, or via the manipulation of Function, Incorporation and Format (see Sections 5.1 and 6.4). Similar series of English words which reduce to a single stem in Ithkuil would be (1) herd, flock, pride, gaggle, etc. ; (2) hair, fur, fleece, coat, etc. ; (3) skin, hide, pelt, pellicle, peel, rind, lambskin, leather, integument, etc. By translative motion is meant the idea of an object moving (or being moved) from one location to another. English is particularly rich in its vocabulary to describe the various paths or trajectories of such an object, not only in regard to the “shape” or form of the path or trajectory, but also the means of initiating the movement. Thus we have terms such as to toss, throw, pitch, hurl, fling, roll, run, or pass a ball or other object. In reaching its destination, the object can fly, float, wing, pass, arc, sail, plummet, drop, fall, thread, hop, leap, bounce, roll, zig-zag, slide, glide, slither, or jump its way there. I tossed it into the basket. It sailed into the basket. I flung it into the basket. It flew into the basket. I hurled it into the basket. It arced its way into the basket. I pitched it into the basket. It fell into the basket. The sentences in the lefthand column describes how I initiate the action while those in the righthand column describe how the object moves. In Ithkuil the lefthand column of sentences would normally all be translated by a single sentence narrowly translatable as I made it end up inside the basket, while the righthand column of sentences would all be translated by the exact same sentence minus the ERGATIVE personal referent I, thus: It ended up inside the basket. So where are the words translating the range of descriptive nuance surrounding the means of sending it into the basket and the different trajectories it takes there? In normal Ithkuil speech, such distinctions would be considered irrelevant. This is because Ithkuil grammar questions all acts, conditions and events as to their underlying cognitive purpose. For the above sentences, Ithkuil views them as all having the same underlying purpose: to express that I have caused an object to pass from a state of being in my alienable possession to a state of being within the basket, by passing through the physical space between me and the basket. Therefore there is only one translation for the varying sentence pairs. Before the reader begins to think that Ithkuil is incapable of distinguishing the shades of meaning present in the above examples, it should be noted that such distinctions can be easily rendered by additional affixes and words describing these concepts. For example, if it is truly necessary to indicate that the object was “flung” into the basket, Ithkuil can augment the sentence I made it end up inside the basket to include affixes which indicate use of the hand in a sudden recoil-like motion plus affixes indicating forceful and rapid arrival into the basket, the result being narrowly translatable as Using my hand in a sudden, subtle, recoil-like motion I caused it to move quickly away and end up forcefully inside the basket. While this would more or less accurately capture the nuances of English “flung,” Ithkuil first makes us stop and ask ourselves, why is it even necessary to describe the details of the trajectory and the force initiating it? After all, in a normal everyday contextual setting, if an English speaker were to use the verb “tossed” or “threw” or “placed” or “put” instead of “flung” in the above sentence, would his/her speaker be considered to have been given information any less sufficient or essential for understanding the message and its purpose? All of which again illustrates the dynamism of Ithkuil lexico-semantics: if a complex, highly detailed morphology already conveys a high degree of semantic and cognitive nuance, why belabor the obvious by reinforcing such nuances at the lexical level if the context and underlying cognitive purpose of the utterance does not require it? Thus the Ithkuil language not only captures levels of cognitive detail beyond the scope of Western languages, but it also allows the speaker to avoid having to provide such detail when it is inessential. In regard to over-lexification in English from a Ithkuil perspective, an example would be limp, as in ‘to walk with a limp.’ Ithkuil recognizes that, in observing a person walking with a limp, it is not the condition per se that is relevant, but rather the manner in which the condition causes the person to move, i.e. asymmetrically, irregularly, discontinuously in an unexpected way inconsistent with a “normal” or “standard” expectation of walking. Ithkuil speakers would consider English limp to represent an arbitrarily specific occurrence of an underlying state of translative movement. To a Ithkuil speaker, what is important is the way the person moves. The idea that a person continues to “have a limp” even when sleeping or sitting is considered absurd. What the person “continues to have” is an underlying physical injury, abnormality, disability, illness, or deformity which causes the person to move asymmetrically when walking. Therefore, instead of He has a limp because of his war wound, a Ithkuil speaker would say He walks asymmetrically/irregularly because of his war wound. 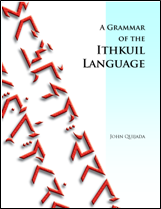 While we have examined the many ways in which the dynamism and logic of Ithkuil grammar eliminates whole swaths of equivalent English vocabulary, there are, nevertheless, many concepts where Ithkuil provides autonomous lexical roots and stems for which neither English nor other Western languages provide similar words and must resort to paraphrase in order to translate. Such concepts are particularly found in the realm of human emotions, social relationships, functional interrelationships between objects, philosophy, psychology, and sensory phenomena. Underlying such differentiation is the idea that the Ithkuil language is meant to reflect in linguistic terms as close a representation of human cognition and pre-linguistic epistemological categorization as is possible in language without resorting to outright linguistic representations of pure mathematical logic. Since the inner mental life of the speaker is often clouded in vagueness or artificial “surface” categories once represented in spoken languages such as English and other Eurocentric languages, a language which is focused on representing that inner mental life will necessarily require many more words to describe that life than are commonly available in existing human languages. Western languages have several words and/or concepts for which there is no exactly corresponding equivalent in Ithkuil. These include the concepts embodied in the verb “to be” and “to have.” Ithkuil has no way of truly expressing copula identification corresponding to “be” or “being”, nor any direct translation of possession or ownership equivalent to “have.” Essentially this is because Ithkuil grammar and lexico-semantics do not recognize inherent existential identification or inherent existential possession as true semantic functional categories or fundamental cognitive primitives. Ithkuil grammar inherently recognizes that the universe is, at any and all moments, and on all scales large and small, in a state of flux. The idea that any given entity can be permanently or innately identified as “being” some other entity is considered nonsensical. Ithkuil grammar has no way of clearly indicating any such notions as “being” or “to be,” as the universe is a universe of actions or states that are the results of actions. Even states, as such, are in flux and different from moment to moment, if only because the mere passage of time itself renders the “static” condition different than it was the moment before. Therefore, one cannot “be” anything else, or for that matter “be” anything at all. Rather, one “does” or “functions as” or “fulfills a role as” or “manifests itself as” something else. Fundamental to Ithkuil grammar are the notions of function and purpose, not mere description; results, not mere means; manifestation, not mere existence. This explains why there is no true distinction between nouns and verbs in Ithkuil, both being mere differences in functional roles played by any given formative concept whose underlying meaning is not inherently nominal or verbal, but rather a conceptual primitive waiting to be manifested as either (1) a representation of an action, process, or event, (i.e., a verb), or (2) as a concrete or abstract entity that is representative of, or embodies the underlying concept (i.e., a noun). So, an Ithkuil speaker does not say I am John, She is a cook, The leaf is green, Stan is ill, or Murder is wrong, but rather One calls me John, She cooks [for a living], The leaf [currently] manifests a green color, Stan feels ill [or carries a disease], and Murder controverts morality. As there are no interjections in Ithkuil, there are no true equivalents to “yes” and “no” in Ithkuil. Nevertheless, Ithkuil grammar also allows for the use of Bias suffixes (see Sec. 5.11) to function as autonomous words to convey attitudes and emotional responses similarly to interjections in Western languages. This phenomenon has already been discussed in Section 8.4. Additionally, Section 8.3 described how affixual adjuncts may be used to convey information similarly to autonomous interjections. Ithkuil grammar recognizes that much of our understanding and expression of everyday experience is structured in terms of metaphor and metonymy (the latter being the reference to an entity by one of its attributes, associations or activities, as in The ham-and-cheese wants fries with his order or The White House has its nose in our business). Ithkuil allows for the overt designation of metaphorical concepts by several means. These include the REPRESENTATIONAL context, stem incorporation, the metonymic MET affix -qt, and the two part-whole PTF and PTG suffixes -rs and -š.